Marijuana Vending Machine Unveiled In Colorado : The Two-Way You may be picturing a vending machine on a sidewalk, ready to dispense pot brownies to anyone with correct change. That's not quite what the backers of the machine have in mind. 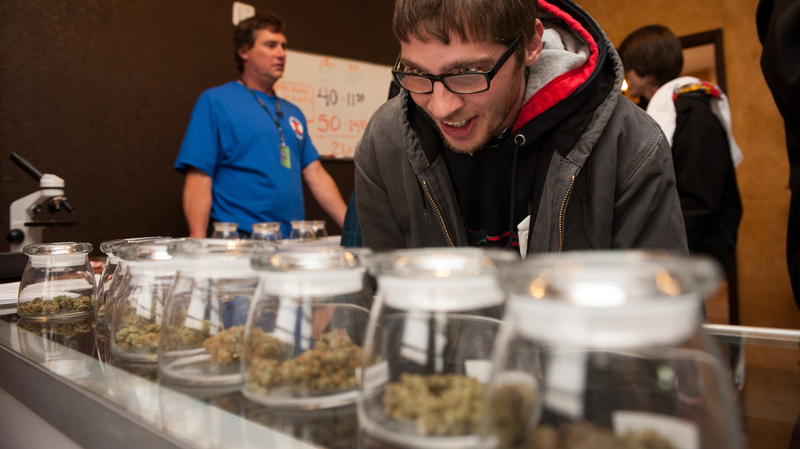 A customer eyes marijuana samples at a Denver dispensary. The makers of a newly unveiled vending machine are hoping to change how pot is sold in stores. An automated pot-selling machine was unveiled at an event held at an Avon, Colo., restaurant Saturday, promising a potential new era of selling marijuana and pot-infused snacks from vending machines directly to customers. Its creators say the machine, called the ZaZZZ, uses biometrics to verify a customer's age. The machine is climate-controlled to keep its product fresh. You may be picturing a vending machine on a sidewalk, ready to dispense pot brownies to anyone with correct change. That's not quite what backers of the machine have in mind. For now, at least, the ZaZZZ is aimed for use only by medical marijuana patients. And it'll be in licensed stores, where it will serve a purpose like that of an automated checkout line at a grocery, they say. The machine is built by American Green; its first model is geared toward selling snacks and other items at dispensary Herbal Elements in Eagle-Vail, Colo. — after the company is sure it has met all regulations. Stephen Shearin of American Green parent company Tranzbyte tells Denver blogger The Cannabist that the vending machine "uses the same technology that checks age/ID fraud under the Control Meth Act. Your identity is confirmed against active biometrics. The machine on display this weekend will not be taking medical cards, but we are prepared to integrate." Shearin also acknowledges that the idea of buying marijuana from a machine will likely have a "wow factor" that could help boost business. The pot machine could also help dispensary owners cut down on employee theft. "We're going to eliminate the middle man," Herbal Elements owner Greg Honan tells Denver's Fox 31 TV. Describing the vending machine's benefits, Honan added that the snacks will go directly "to our budtender, right into the machine. There's no room for theft by patients, by employees — there's no way to lose track of the inventory." The ZaZZZ isn't the only marijuana vending machine out there. Both Arizona's Endexx and California's Medbox have made headlines for their efforts to streamline pot sales. But as far as we've seen, those companies' products are kept behind stores' counters — for now, at least.